"If you’re in my situation, please don’t resort to verbal abuse over things that scare/ frighten you, be strong, talk to people in a civilized manner, and open up to them. 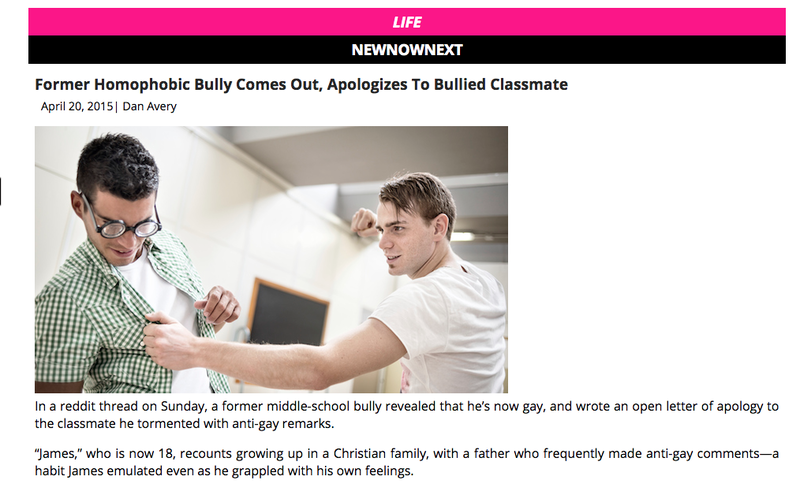 I know I’m gay, I think I bullied Nate so much because I was afraid of being like this, I wanted to be the strong straight kid my dad always wanted." "Again I can’t apologies [sic] to Nate now, but if I could I would want to tell him this: I’m sorry for all the verbal harassment I put you through, the truth is I always thought you were pretty cool and sort of attractive, and that frustrated me." That stopped me in my tracks. The kid bullying Nate thought Nate was attractive?!? And that was what fueled much of the meanness??? WOW. "the truth is I always thought you were pretty cool and sort of attractive, and that frustrated me." "James" goes on to address those who are being bullied right now and hopes they can stay strong. What a shame "James" couldn't have figured that out sooner, without making Nate's life miserable. Here's to epiphanies for all the kids and teens who are acting like bullies!